It's finally Halloween! I'm going to savor every delicious moment of it. I've got a bunch of written posts going up throughout the day and 3 different YouTube video reviews! So be sure to check back periodically to see what spooky goodies I've scrounged up. It's like Trick-or-Treating, but online, and none of you get to eat the candy. Actually, two of you can! I have my giveaway going on from now until 11:59PM TONIGHT (10/31/16.) On November 2nd I'll announce the winners, so be sure to enter, you've still got time left! While you're busy entering the contest, I'm going to start munching on some spooky seasonal Skittles. Inside there are 5 different flavors, but the majority of those flavors are repeats...and this is where the disappointment settled in. Gripping Grape (purple) - It's grape, just like in the normal mix. It's sweet, and a little raisin-like, with a hint of artificial concord grape juice. Nothing to see here, but what's with the name? Were "Ghastly-Grape" or "Ghostly-Grape" already taken? Lurking Lemon (yellow) - Again?! Even though the name is adorable, this is just a plain lemon Skittle, and it tastes exactly the same as the ones in the original mix. It's tart, but sweet, and tangy. 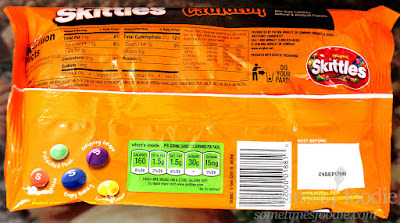 I love lemon Skittles, but I was expecting this mix to have more originality. Twisted Tangerine (orange) - Well, this is kind of different. Instead of normal orange we get Tangerine, which is a bit sweeter, less zesty, and brighter than classic orange. It's not a huge difference, but I like it. It reminds me of Ecto-Cooler, but these days anything citrus-flavored and Halloween themed seems to do that. Petrified Pear (green) - FINALLY! A new freaking flavor! This was the most refreshing and interesting flavor in this mix, although it has a tartness that is reminiscent of the classic lime Skittle, it has a distinctly pear-like flavoring to it that is perfect for fall. We rarely ever see pear flavored candies, and I really enjoyed it's inclusion in this mix. Sweet, earthy, tangy and a little overripe. I dig it! Boogey Berry (blue) - It has hints of blackberry and raspberry, but it's a fairly generic artificial beery flavor that I don't enjoy all that much. 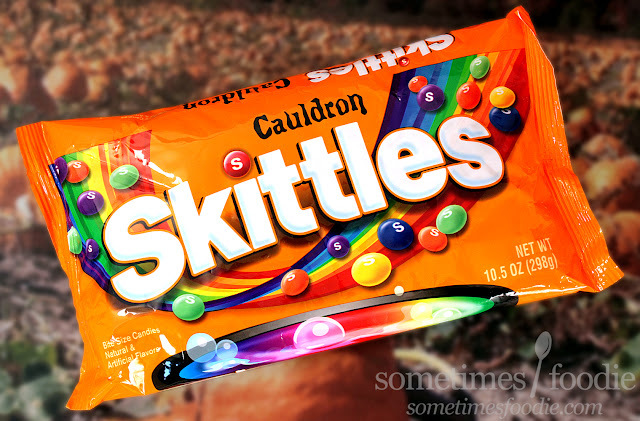 Which is a shame because it's one of the only truly new and original flavors in this mix. Easily my least favorite of the five. I was really excited for this mix. It has a cool name, and it's tied to my favorite holiday of all time, Halloween! Sadly, the majority of these flavors are slight variations or flat-out copies of flavors from the original mix. Which is a bummer. 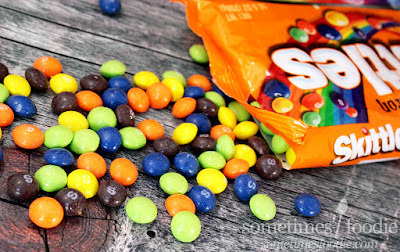 If all they were going to do is copy previous flavors they could have revived the candy apple and red licorice Skittles from the Carnival mix, I would have been over the moon! Even with the lack of creativity, these were still really snackable. My b/f and I nearly polished off the bag last night while we were watching CLUE (a Halloween must), but I really want to see Skittles break the mold and stop playing it so safe. This new pear flavor is a step in the right direction. I'd really like to see new and unexplored flavors next year. I've seen those online but I haven't had any luck finding them in person yet. 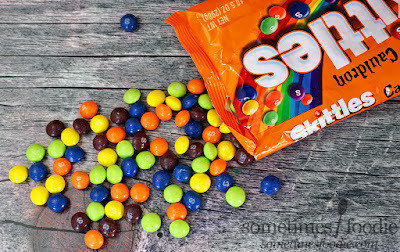 Skittles are awesome, but I really wish they'd re-release the Carnival mix and try to have more fun with their flavor offerings. I had the brightside, these are actually good. Only 1 repeat and it's watermelon (from the sweets and sours mix). And Skittles Riddles will come back as Trick Plays in fall 2017-early 2018. Maybe the flavors will be different this time? I saw that, to be honest I'm not all that excited for those since they are pretty much re-branded versions of stuff released before. 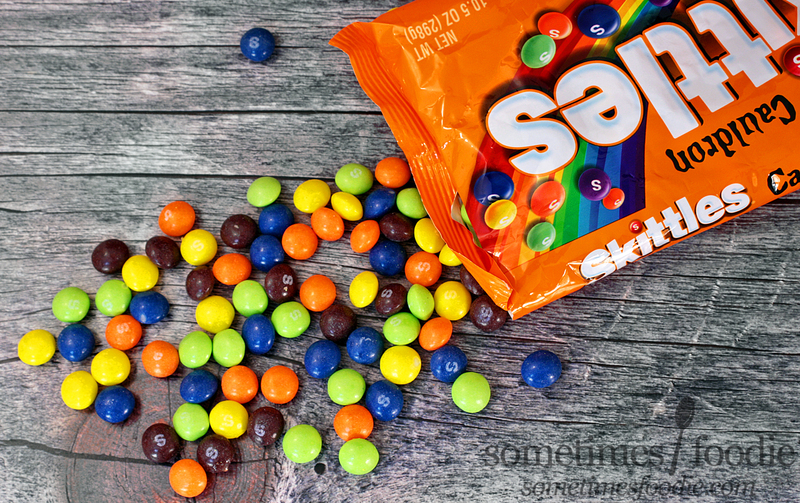 Skittles needs to get their head in the game and bring us something to really be excited about. I love them wish I could find them somewhere. I saw some in the Target clearance section, but Target clearance goods move fast!